For as long a time period as I care to make allusions to, I've enjoyed making my own maps for dnd. I create better stories when I have geography to work with, and I often get inspiration by creating both the history and landscape of my worlds simultaneously. In the last couple years I have experimented with making maps in Photoshop and I figured I would write down what and how I do it. First of all, you gotta start with layers. I actually start at the macro scale and want a nice gradient or cloud-filter blue type color for water as the background layer. The next layer, the basic landscape as a flat mix of colors is applied using various brushes on the airbrush tool. I also experiment frequently with transparency and color blending to get a more natural look before I add bigger terrain like mountains. 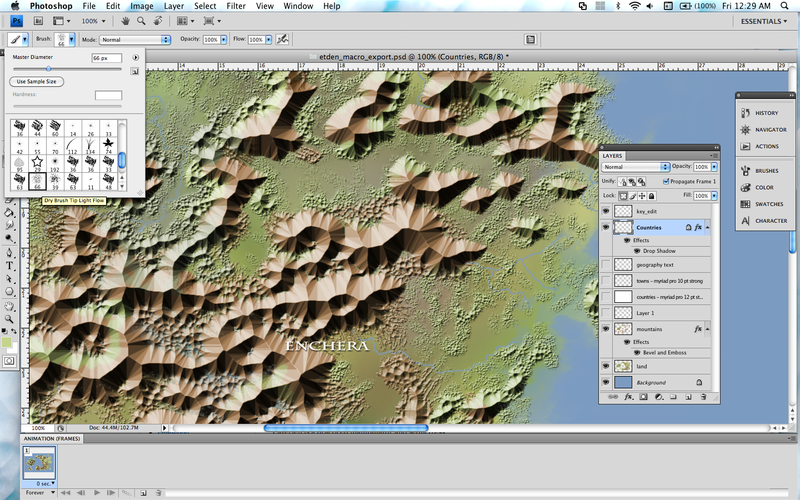 I use layer effects on the mountains. bevel & emboss set with 'chisel soft' gives a decent look. I am still looking for a better way, but that is my current method. I like using various brushes--the spray type ones work especially well--to get a rumpled look on the edges of the mountains. Transparency can be your friend on this, once again. Oh yeah, when I refer to 'transparency' what I mean is, applying that to the stroke of the drawing tool, not the layer itself. To get water, I actually use the eraser tool with a wide range of brushes and transparencies depending on whether I am doing coastal lines, rivers or lakes. I'd be glad to expand on these sections when I have time, or if there is a demand I might speed up the timetable.